The Sierra Norte de Sevilla Geopark is a protected natural area overflowing with geological heritage, whose aim and purpose is to protect geodiversity, to promote the geological heritage and to boost sustainable economic development.The geopark is managed by the Department of the Environment of the Andalusian Regional Government through the good offices of a large team of environmental conservation and sustainable development experts. The geopark, located to the North of the province of Seville, was declared a Natural Park by the Andalusian Parliament in 1989. Within its boundaries there lay two Natural Monuments of a pronounced geological nature, plus several spots of geological interest included in the Inventory of Andalusian Georesources (2011). Covering an area of 177,484 hectares, it is one of the biggest natural parks in Andalusia, the largest part of the territory being private property. The Natural Park’s limits encompass, totally or partially, ten municipalities and are home to more than 29,000 inhabitants. 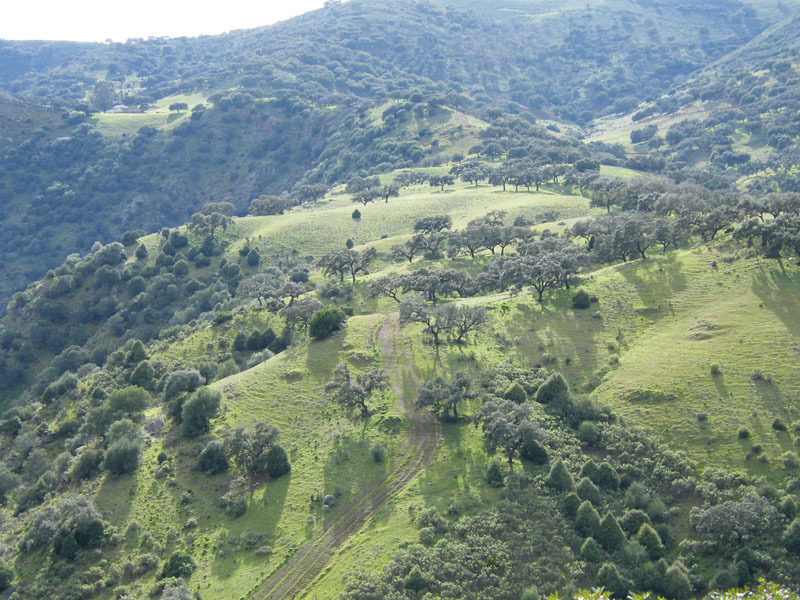 The Sierra Norte de Sevilla Geopark lies in the mountain alignments of Sierra Morena’s central region, between the Ossa-Morena and the Southern Portuguese geological areas, both being a part of the Iberian Variscan Orogen. The majority of rocks date back to the Precambrian and the Palaeozoic, probably also to the Triassic in some areas, with the exception of the park’s South-eastern sector, where there are some outcroppings of Miocenic sedimentary rocks, belonging to the Guadalquivir River sedimentary basin. Since its beginnings as a natural protected area, the Sierra Norte de Sevilla Geopark has promoted the development of geo-tourist products. The magnitude of the geopark along with its geological, archaeological and mining richness has made it possible to create an array of no fewer than 32 Spots of Geological Interest and several Geotourist Routes of a short to intermediate length. 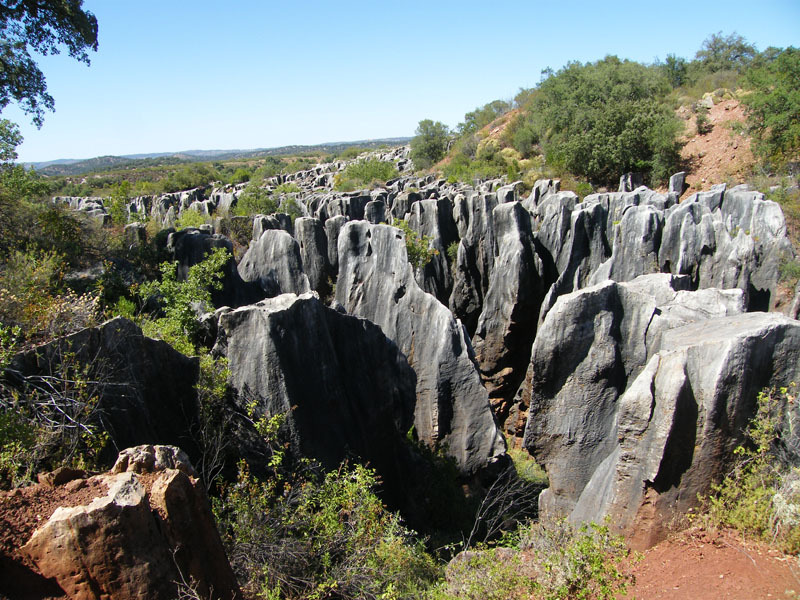 The Precambrian to Palaeozoic rocks of the Ossa-Morena zone, involved in the main structures of the Geopark. Special relevancely is the “Capas de Campoallá” formation, a detrital-carbonated succession from the lower-middle Cambrian. The “Cerro del Hierro” karstic complex and mine, declared a Natural Monument: a spectacular palaeo-karst originated in the middle-upper Cambrian over limestones from the lower Cambrian, which includes a mining operation which exploited the iron orebody in the karstic cavities since Roman times up to 1986. The Valley’s Syncline, whose sedimentary record from the Ordovician to the Devonian, in conjunction with the abundance of fossils from pelagic species, makes the palaeo-geographical and environmental reconstruction possible of the passive margin of the marine shelf between the Ossa-Morena and the Central Iberian zones. The large site containing medusa imprints from the lower Cambrian, whose interest lies in the anomalous size of the imprints and in the uniqueness of their morphology, it being the largest concentration of specimens known in the Iberian Peninsula and one of the largest in the world. The beautiful crag-land landscapes having evolved from the geopark’s abundant igneous rocks: spherical rocks, crags, dales and plains with development of sandy soils, cupola-shaped domes, caballera stones, etc. The “Beja-Acebuches” amphibolites located in Almadén de la Plata and construed as the remains of an old ocean floor, which would be a sign of the existence of an old suture area between tectonic plates. Materials dating back to the Permian and the Triassic which represent the filling of post-orogenic continental basins, with abundant fossil flora, from which the existence stands out of large petrified tree-trunks. The River Huéznar waterfalls and its associated Travertine deposits; it is the other Natural Monument in the Geopark. And the old and varied mining and stonework activities carried out in the whole of the geopark. The aforesaid localities are integrated into different geotourist routes that make the enjoyment possible of geological and landscape-related values, not to mention those linked with wooded areas, fauna and culture. The Sierra Norte de Sevilla Geopark covers an area of Sierra Morena whose landscape is predominantly made up of large holm oak and cork oak meadows. In the said trees species threatened with extinction, such as the black stork or the Spanish imperial eagle, have their nests. The highlands’ orography is gentle and made up of hillocks, typical of old massifs subjected to erosion for a long time. 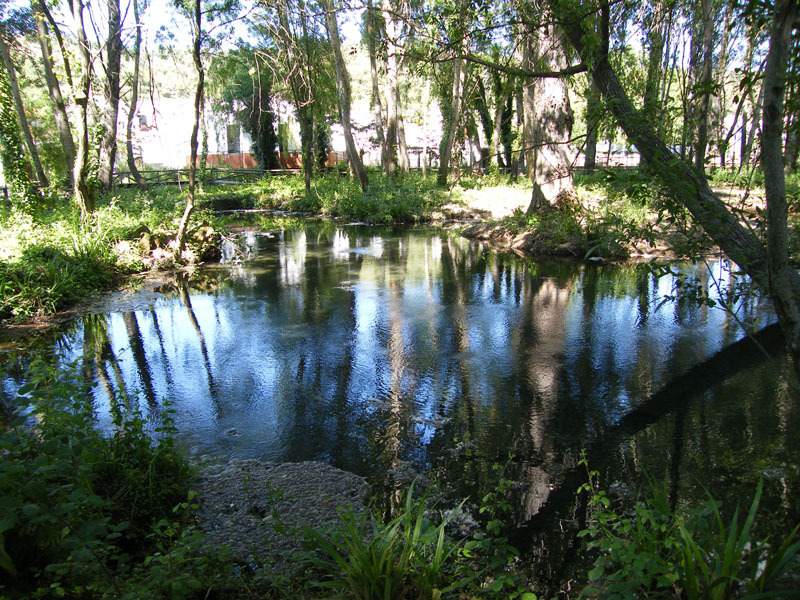 The Viar and Retortillo rivers, and the Huéznar brook, all of which are tributaries of the Guadalquivir, make up the fluvial network which is the geopark’s drainage system.The geopark’s vegetation is well suited to the Mediterranean climate of dry and hot summers and mild winters, the holm oak and the cork oak being its most characteristic species. These, as we climb towards the geopark’s highest areas, gradually give way to other, more wetness-hungry species such as the gall oak and the Pyrenean oak, locally known as “Rebollo” or “Roble Melojo”. 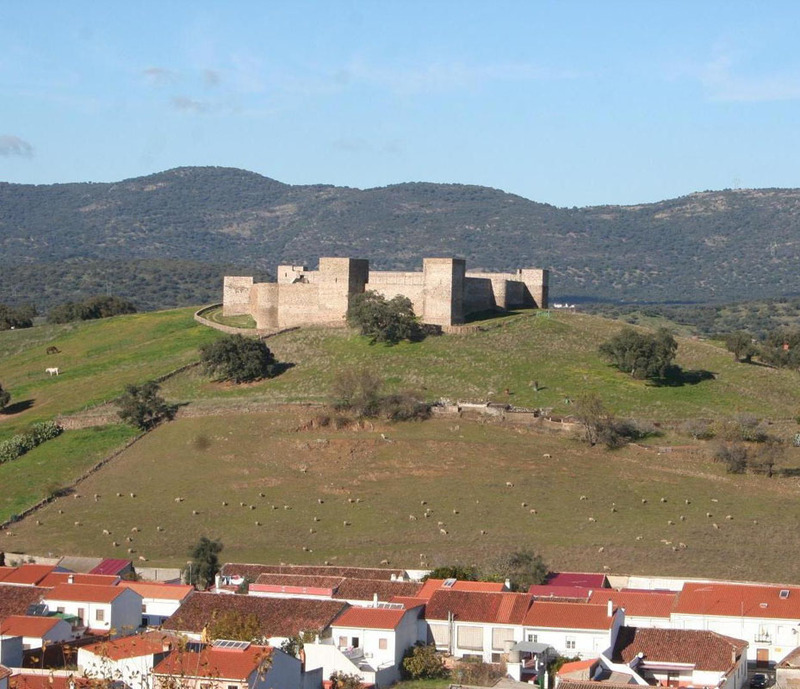 Since ancient times, the western part of Sierra Morena has been an area of very important economic activity due to the mining of its natural resources, and for being the nexus of the Guadalquivir Valley and Lower Extremadura, close to the Roman Way known as the “Silver Route”. The part of Saint James’ Way going through the geopark, which follows the Silver Route, runs through the municipalities of Almadén de la Plata and El Real de la Jara. Due to its strategic location, close to the Portuguese frontier, it became during the Late Middle Ages a defensive post against possible attacks by the neighbouring country. On the other hand, it was the place through which the main roads were plotted that link the West of Andalusia with Castile; such ways became the channel for the flow of the Northern cultural currents which brought about not only the settlement of population and the development of its centres, but also the creation of an important cultural legacy which has left numerous historical and artistic manifestations. That’s the reason why the geopark is also rich in archaeological sites, and what explains the finding of dolmens used as burial places, as well as numerous settlements and necropolises from Roman times. Likewise, there exist caves with remains of prehistoric civilizations such as “Las Cuevas de Santiago”. The Geopark have been the place of settlement of prehistoric populations (in the Neolithic, the Copper Age and the Bronze Age) as well as of other peoples (Celtiberian) and civilizations (Betic-Roman and Islamic), which have turned this region into a land rich in History and Culture. The rich archaeological heritage of the geopark, where 98 archaeological sites have been inventoried in the Andalusian Historical Heritage Information System, will suffice to prove the point. Twenty-six new sites have recently been delimited in the “Melonares” reservoir’s area of influence and compensation. On the other hand, home-made and farmhouse products such as wines and anisettes; Iberian pork products, such as meat and cold meats; goat’s milk cheese and different varieties of honey, are internationally renowned. 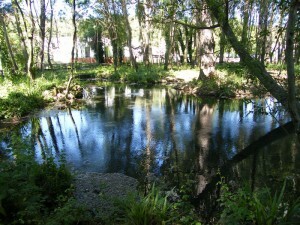 There are numerous products included in the “Andalusian Natural Park” brand. In addition, local gastronomy specializes in a wide range of game, shepherds’ dishes and highland sweets. The Sierra Norte de Sevilla Geopark tourist establishments have made a firm commitment to sustainable tourism. The European Charter for Sustainable Tourism (ECST) task force is currently working on the preparation of the new Sustainable Tourism Strategy and on the new 2012-2016 Action Plan. These tasks are validated by the ECST Forum made up of about 50 bodies, 28 of which are geopark-based tourist companies. 1 Camping, 29 Signposted Paths and Viewpoints, 7 Recreational Areas, 2 Visitor Centres and 1 Botanical Garden.